This is my first post of this kind, Tasty Germany, and I plan to make many of them because I love food. I love trying different food, even if sometimes I don’t order local specialties of the place I’m currently at. Each dish has its own charm, regardless whether it’s a simple hamburger or some complicated dish. Anyway, as you may know from my recent posts, my last trip was in Germany. I enjoyed lots of wursts (German sausages), I drank all kinds of beer and went to Oktoberfest. For the needs of this post, I spent lots of time taking photos of the things we ordered, even though I dislike doing that. I prefer enjoying the food, eating the food and then remembering the taste of the food. Why risking ruining the first hour of arrival with unfamiliar dishes when you can have a marvelous hamburger, right? These traditional Nuremberg mini wursts make for a delicious lunch. Served with a cold and sour potato salad, a nice bun, and pretzels. What’s better for a dinner in Nuremberg than these delicious wurst sandwiches. Served in hot-dog buns and spiced up with grilled onion, they offer a taste that’s hard to forget. While at Oktoberfest, I went for a pork chop served on a bun with grilled onion. It was delicious! I want to try preparing it at home, even though I don’t know how to recreate the Oktoberfest atmosphere. 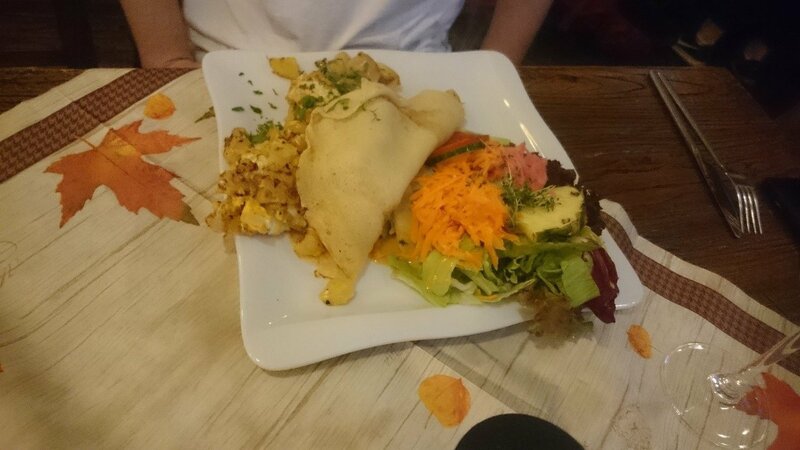 We had this fabulous dinner in Memmingen at a place named Zur blauen Traube(official page). Their prices were reasonable, yet not cheap. Regardless, I will never regret tasting these wonderful dishes from the German cuisine. 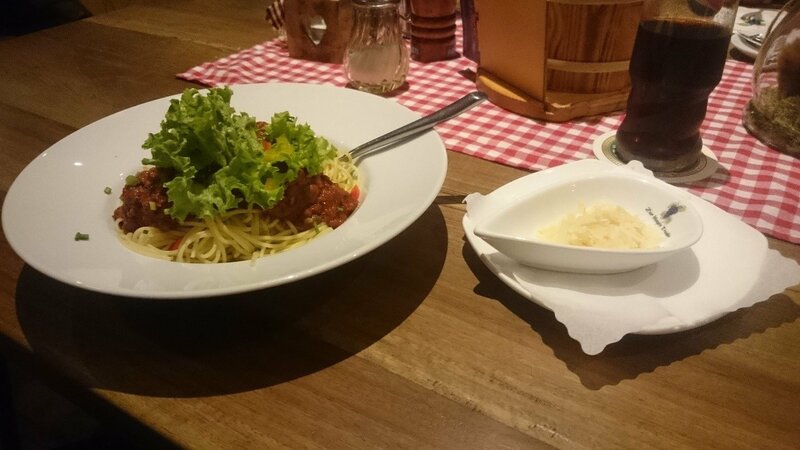 On our second visit at the Zur blauen Traube, I went for some Bolognese and my friend decided to try something new. 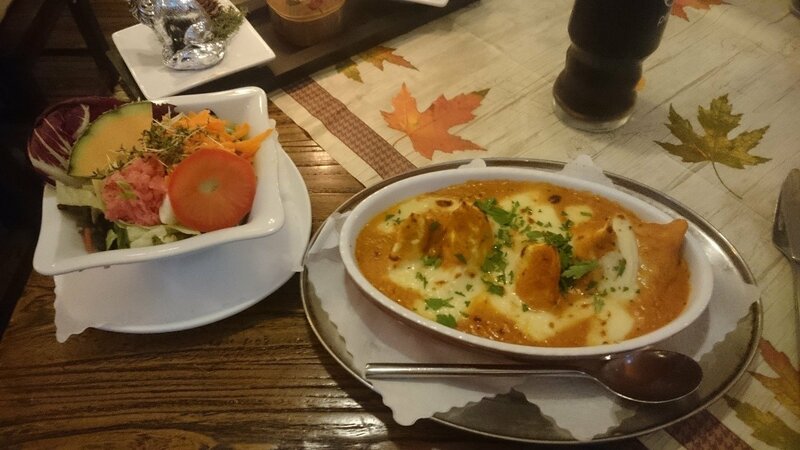 She ordered pork cutlets served with some German pasta, a dish she said was delicious. Pretzels are everywhere in Germany and I’m telling you they are awesome. When served during a cold autumn morning with a hot cup of coffee, pretzels can be very satisfying. 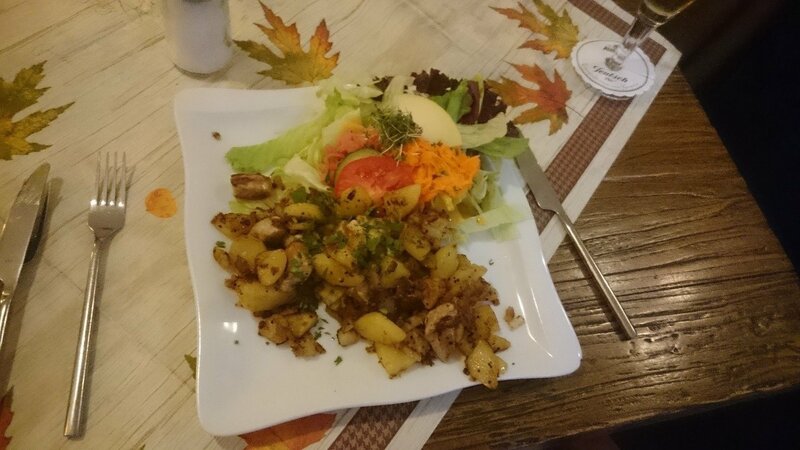 Plus, at Robert’s in Memmingen (Facebook Page), they served them with butter, which gives a nice twist. Hot Love is an incredibly tasty dish, which is a mix of hot and cold. One bowl contains the vanilla ice-cream. Another bowl has the hot berry fruits (something between compote and marmalade). Then the berry fruits are poured over the ice-cream. Once you taste it, you go to heaven. A creative way of serving pancakes! At Oktoberfest, you get mini pancakes served in an edible bowl. The toppings are many, but I usually stick to Nutella and banana only. This wasn’t my favorite, but why not share it anyway: a standard raspberry cake. Its topping didn’t please my expectations due to the excessive presence of jelly. So, guys, that’s all…at least for now. Soon I plan to add other posts about food in other countries, and update this one of tasty Germany if I visit again! Also, read up on our stay in Germany by checking out our reviews on the Drexler’s Parkhotel and Kellermanns Apartments. Hope you enjoyed the photos and drooled a bit!